Ken Isaacs, U.S. candidate for Director general of the United Nations' International Organization for Migration (IOM) is pictured in this photo released by U.S. Mission Geneva, in Geneva, Switzerland, June 28 2018. In a defeat for the United States at a multilateral organization, the Trump administration's candidate to lead the U.N. migration agency lost his bid in Friday's election. The U.S. has led the International Organization for Migration for most of its existence. It was established in 1951 to help resettle millions of European refugees after World War II. It formally became part of the United Nations in September 2016. The American nominee, Ken Isaacs, a long-time vice president of the Christian evangelical relief organization Samaritan's Purse, became a contentious candidate after disparaging tweets and social media posts he had written about Muslims were reported in the media. 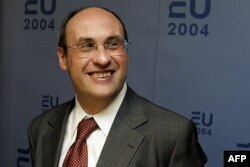 FILE - Then-European Commissioner for Justice and Home Affairs Antonio Vitorino smiles following a meeting between the EU and the U.S. in The Hague, Sept. 18, 2004. The largest U.S. Muslim civil rights and advocacy organization, the Council on American-Islamic Relations (CAIR), welcomed Isaacs' defeat. "We welcome the rejection of an individual with a history of bigotry and hope this sends a message to Mr. Trump that even if Islamophobia is welcome in his administration, the international community and its institutions will not empower anti-Muslim or anti-immigrant views," said CAIR National Executive Director Nihad Awad in a statement. "Trump nominated a candidate to head the International Organization on Migration with a history of social-media posts disparaging Muslims," Human Rights Watch Executive Director Kenneth Roth wrote on Twitter. "The rest of the world wanted nothing to do with that and rejected him." Isaacs had defended his previous social media posts during a news conference with reporters at the United Nations last month. "Twitter and 140 characters is not a very good way to make comments, but it's also not a good way to capture the context of what was said," Isaacs said. "Would I tweet again, no I wouldn't." He acknowledged that he had apologized for "the hurt I caused" and added that he has "hundreds" of Muslim friends around the world. Some U.N. observers characterized Isaacs' defeat as a reflection on U.S. policy on migration, including the travel ban on persons from some Muslim-majority countries which the U.S. Supreme Court upheld this week, and the separation of families seeking asylum on the U.S. southern border. "Isaacs was a capable relief expert, but carried significant baggage due to offensive prior statements about refugees and migrants, and apparent climate denialism," said Jeremy Konyndyk, Senior Policy Fellow at the Center for Global Development and a former USAID official. "Putting forward a candidate with this profile was an unwise move by the Trump administration." The administration had strongly backed Isaacs, with a statement supporting his candidacy from the White House in May, saying he is the "type of leader we need at the helm of IOM." U.S. Ambassador to the U.N. Nikki Haley hosted a reception for Isaacs in New York in May to introduce him to other ambassadors. The United States is the IOM's largest single donor, contributing about 30 percent of the agency's $1.4 billion budget. The rejection of the U.S. candidate left a question mark over whether the administration may slash its funding. The Trump administration has already cut hundreds of millions of dollars from U.N. agencies that it has policy or ideology disagreements with, including the agency that assists Palestinian refugees (UNRWA) and the U.N. Population Fund. It has also withdrawn from the U.N. Human Rights Council and the U.N. Educational, Scientific and Cultural Organization (UNESCO). In addition, it has exited negotiations on a global compact about migration, saying the compact is not consistent with American immigration policies.